The upcoming lunar journey has several significant dates, which you may want to note in your Moon Chart or journal. These include not just the major phases of the Moon, but also a Cross-Quarter Celebration Day (Lughnasadh), two eclipses and a SECOND New Moon in Leo! Celebrating the First Harvest (grain), the Celtic God Lugh and the Celtic Goddess Áine. Cross-quarter days are defined as the midpoint between a Solstice and an Equinox (and vice-versa). This day is now traditionally observed on August 1st. However, many still celebrate on the actual midpoint which — this year — is August 7th @ 00:13 UTC (August 6th @ 5:13 PM PT). A partial lunar eclipse will take place on August 7 starting at 15:50 UTC (8:50 AM PT) and ending at 20:50 (1:50 PM PT), with peak coverage at 18:20 UTC (11:20 AM PT). Because Moon Set that day is 4:21 AM PT, this eclipse will not be visible as the Moon will be below our horizon. A total solar eclipse (but here in Vancouver will appear as a partial… but very close to total) will occur on Monday, August 21 — just after the arrival of the New Moon — and will be mostly visible in North America. According to TimeAndDate.com, here in Vancouver the eclipse will begin at 9:10 AM PT, end at 11:37 AM PT, and will peak at 10:21 AM PT. This New Moon in July is always one near to my heart, for many reasons. It is in the Fire sign of Leo, a sign of courage, creativity and passion… and the heart (“coeur“-age), both physically and energetically. And it arrives just a week before Lughnasadh, the cross-quarter date associated with the First Harvest (grain) commonly celebrated on August 1st or thereabouts. The Wheel of the Year is turning towards Autumn in the Northern Hemisphere, the Third /Waxing Quarter, the West of the year. This is a time to reflect on the goals, intentions or words created roughly six months ago at Imbolc or at the New Year…. a mid-point review, as it were. Did you know that the questions we ask of the Moon Phases in the New Moon Medicine Wheel layout can also be applied to our Soul Work at the Cross-Quarter Days? East & Imbolc: What is beginning? South & Beltaine: what is flourishing? West & Lughnasadh: What is transforming? North & Samhain: What is the lesson? This gave me the theme for this month . 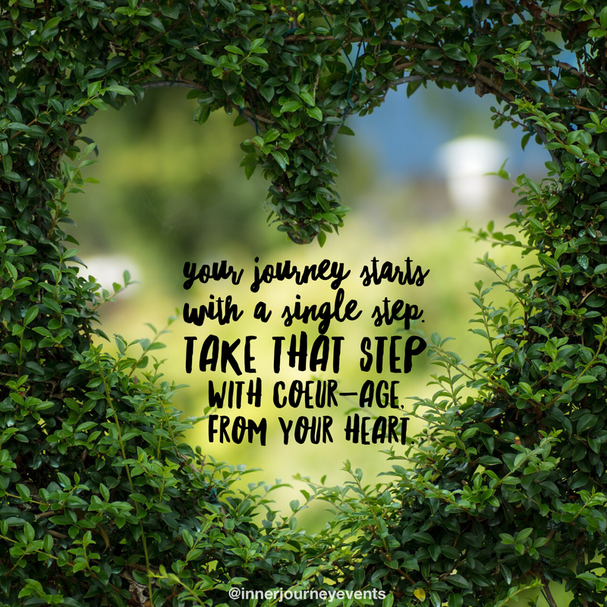 . . not just Coeur-age but Coeur-ageous transformation, looking at how I have transformed this year, what transformation is still shifting, moving, changing and how my connection to Heart supports that. Perhaps one of these themes works for you, or perhaps something you create will resonate even more, based on your Soul Work so far this year? The New Moon has been described as an energetic doorway, inviting us in to connect with what we want to create. During these days of the Dark Moon / New Moon, I will step through that energetic doorway and journey to my own transformation and into my Heart to find my specific goals for this lunar journey (to be confirmed by the Waxing Crescent). Join us in our Facebook group, the Wise Woman Bean Gealach Circle where we delve into the theme of courage more deeply, with Soul Questions and more -- to support one's meditation or journeys with the theme through the full cycle of the moon. What has transformed in me or in my world since setting my goals (words, intentions) at Imbolc/New Year? What actions did I take to support, honour and manifest those goals (words, intentions)? What else must I do to continue supporting, honouring, and manifesting that which is still transforming? How has my Heart supported me in my transformation. . . and how have I supported my Heart? What part of my transformation or manifestations took me to a place of discomfort? How did I resolve that discomfort? Did I bury it again? Did I bring it to the light? Did I heal it? Did I change it? To enhance your Soul Work this month, consider making this New Moon Essential Oil blend to add to your diffuser when meditating or journeying. You can also add to one tbsp (15 ml) of your favourite carrier oil and use for anointing new spiritual tools.